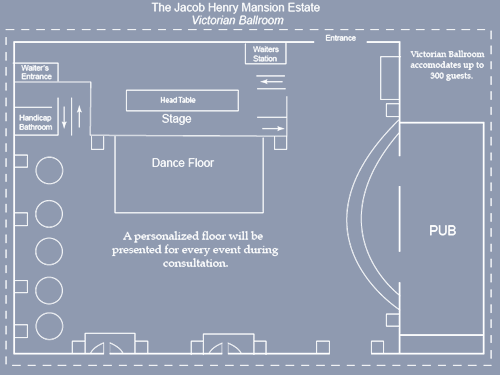 The Victorian Ballroom, on the Jacob Henry Mansion Estate, was completed in late 2005. It boasts a romantic theme of Victorian and Italiante style ambiance. The warm and inviting hues of burgundy, cream, and deep greens compliment the open, inviting atmosphere. The Ballroom comes complete with a full stage, large dance floor, and a unique pub setting with an European fireplace that adds to any photo opportunity for your special occasion or event. A short walk from our non-denominational chapel, in the Old Central Church, the Ballroom is encompassed by a full promenade walkway making it perfect for outdoor cocktails, hors d’oeuvres, or romantic strolls as the evening draws to a close. 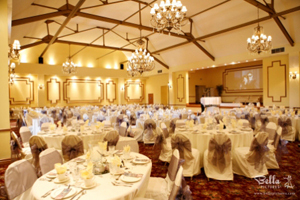 Whatever the occasion, the Victorian Ballroom is a beautiful compliment to any social affair.